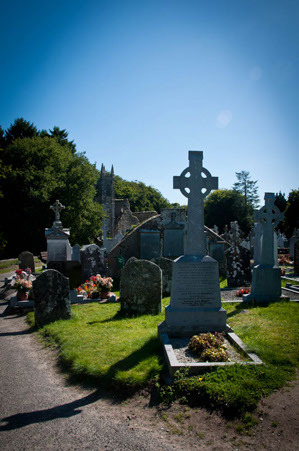 The graveyard at St. Mullins, Co. Carlow. St Mullin's (Irish: Tigh Moling) is a village situated in the south of County Carlow on the eastern bank of the River Barrow in Ireland. The place is named after Saint Moling, who founded a monastery there in the early 7th century. Ruins of a later monastic buildings still remain, located in an old cemetery. A large mound, the remains of a Norman motte, exists near the entrance to the cemetery. It is one of Carlow’s most important archaeological sites containing aspects of both religious and secular history. It is very much a place of tradition with both the graveyard and holy well still in use. It is located in the scenic surroundings of the very south of the county with the River Barrow forming the county boundary with the Blackstairs Mountains overlooking it on the east and Mount Brandon on the west. St. Moling was born in 614 A.D. a prince, and during his lifetime he became a poet, artist and craftsman, as well as a priest. Under the patronage of Mae doc (Aidan) of Ferns he built his monastery in St. Mullins in the 7th century. He dug a mile long watercourse with his own hands to power his mill, a task which took seven years. He was made Archbishop of Ferns in 691. During his lifetime many miracles were attributed to him. He died in 696 and is buried in St. Mullins. The Monastic Ruins, which all post date the lifetime of St. Moling show that his monastic settlement continued for many centuries and with the construction of the Church of Ireland Church in 1811 the site continued to be a place of regular worship right up to recent times. There are the remains of three churches on the site including the Tempall Mor, the great Church and it is reputed to contain the grave of St. Moling. The remains of some domestic buildings and the base of a round tower complete the main structures. The site also has the cross section of ninth century granite High Cross which depicts the Crucifixion. St Mullins was once an important point on the Barrow Canal. The river becomes tidal at St. Mullins and there are old grain stores at the canal side, one of which has been turned into a cafe. 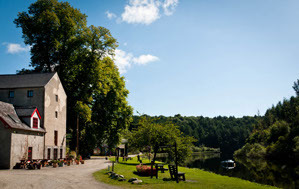 There are many scenic walks around St. Mullins including one marked out by the Irish Heart Foundation the "Sli na Slainte" ("path to health", in Irish). This 6km walk follows the canal up river, then branches through beautiful Bahana Wood, emerging to give some of the best views of the Blackstairs Mountains nearby. There is excellent fishing all along the river at St. Mullins, especially below the weir where the trout are small but plentiful. Check our site--- watchcopiez for the latest rolex replica sale in the market and we rightfully say that they cannot be ignored with just a glance. You will certainly be left staring at them with your eyes wide open at their replica watches sale and the most important, their reasonable prices. The Cheap Replica IWC is a thing of beauty and what's more, it is designed exactly like the original ones when replica watches sale comes to the functionality. They are the splitting images of the original high end ones and the site takes great care so as not to give away rolex replica sale that they are Replica IWC Watches. These watches are made by the best craftsmen in the business and are your money's worth. For all those people who want to stand apart in a big gathering and who want to be noticed, our tag heuer replica will definitely help you realize your dreams. You will become the heartthrob of everyone and your list of rolex replica sale will increase by leaps and bounds.